U.S. Bank is dedicated to making possible happen for its customers and communities. U.S. Bank is dedicated to making possible happen for its customers and communities. They make possible happen for their customers by helping customers navigate their deeply personal financial milestones. Read our bloggers' reviews and see how U.S. Bank has helped them in their financial situations. 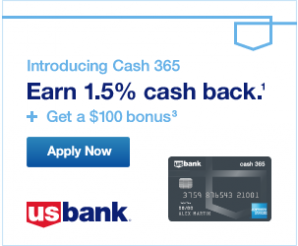 Plus U.S. Bank is offering $100 for people who spend $500 in the first 3 months and have a relationship with U.S. Bank. If you do not have a relationship, you can open one and still receive the bonus if done within 30 days. 365 Days of Adventure Sweepstakes on BlogHer runs from 8/1/2016 through 9/1/2016 and is only open to individuals who, at the time of entry deadline, are legal residents of the United States and are 18 years or older. Click "here" to read the official rules. Winners will be randomly selected from all eligible entries. Good luck!